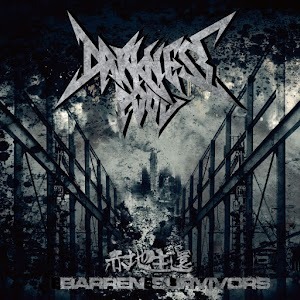 Barren Survivors is the debut album of local thrash metal band Darkness Pool. It is a great album of headbanging intensity that is technically masterful as well as surprisingly genre-bending. The album starts off with a prog rock type power metal instrumental track, which is an unexpected but effective way to draw the listener into the album. The keyboard played in the foreground of the song acts as the melody that then leads into a slow building guitar solo. The song starts the album off in a mysterious, slightly gloomy way making the listener wonder what they are going to hear next. In Track 2 we get into the meat of the album with the genuine thrash metal music and the listener is immediately struck by the intensity of the guitar and drum pounding. The drums are a big standout on the album. The drummer, Eric Kwan, uses intricately crafted beats that are intense. Whenever the drum starts to get boring the bassist, Shears D Haifisch, comes in and prods it along with excellent booming grooves. The guitars are also really well done by Don Leung and Erik Chan with the rhythm guitar having a Master of Puppets era Metallica feel: extremely hard hitting and slightly punky. The lead guitar however changes things up drastically. The soloing on this album goes into an almost power metal direction, which wouldn’t be out of place on a Dragonforce album. The vocals are also extremely well done. The vocalist, Ah Yiu, has a great growl feeling that is reminiscent of death metal but with the intensity required for thrash. One issue I have with the vocals is that the vocalist doesn’t differentiate his vocal style often. However he has complete control over his death growl that hold the songs together. The rest of the album is replete with vibrant drumming, intricate soloing and intense riffing, but one of the more unexpected elements is the genre bending. Although thrash metal can at times feel like it’s only hitting one note, Darkness Pool avoids monotony by incorporating more singing and different instruments that give the songs added character. in addition to Track 1 and Track 7, both of which combine prog rock with thrash metal, Track 4 is a great indicator of the unexpected turns this album can take. It starts off with a surprising organ intro that effortlessly segues into the type of thrashing Darkness Pool do so well. Then the song goes into a Iron Maiden style sung chorus which works very well to differentiate the song from the rest of the album.